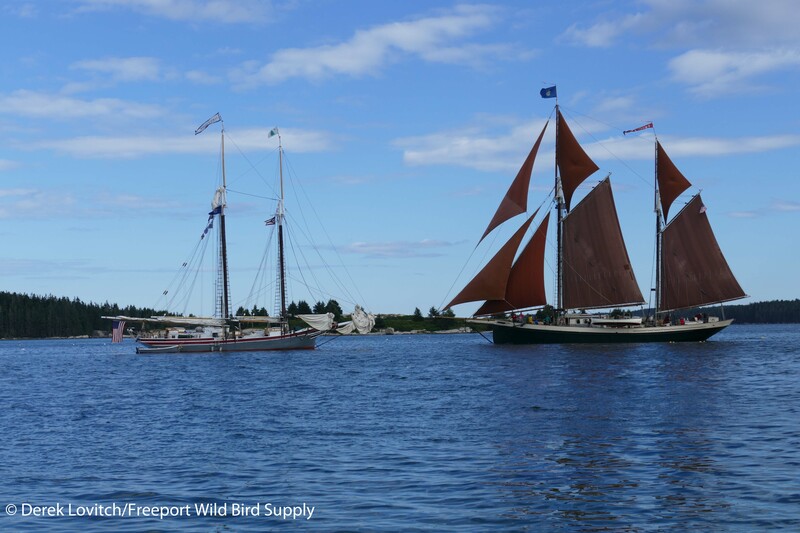 It’s hard for me to pick my “favorite” tour, but if pressed, I would probably answer our annual “Birding by Schooner” aboard the Lewis R. French tour. 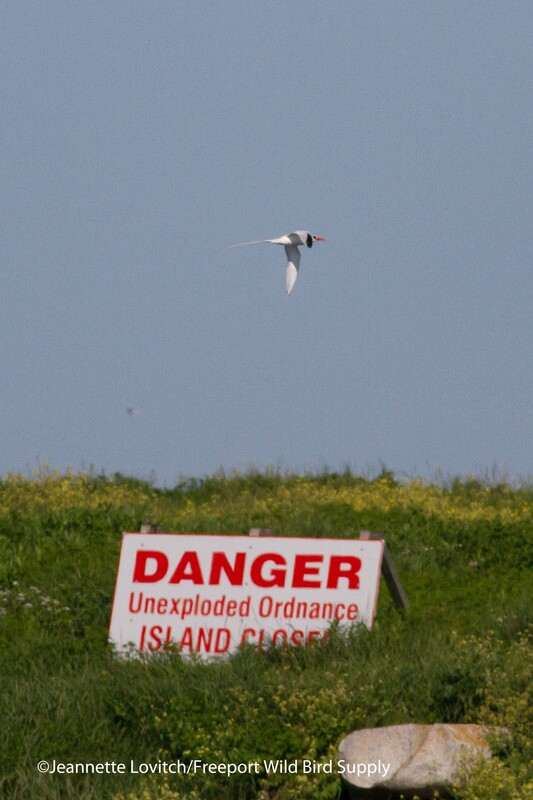 It just offers such a unique way to bird, and such unique birding experiences. The scenery, the food, and the good conversation can also not be beat. Last week was my 6th tour aboard the French. And one of the aspects of the tour that I so very much enjoy is that every tour is different. 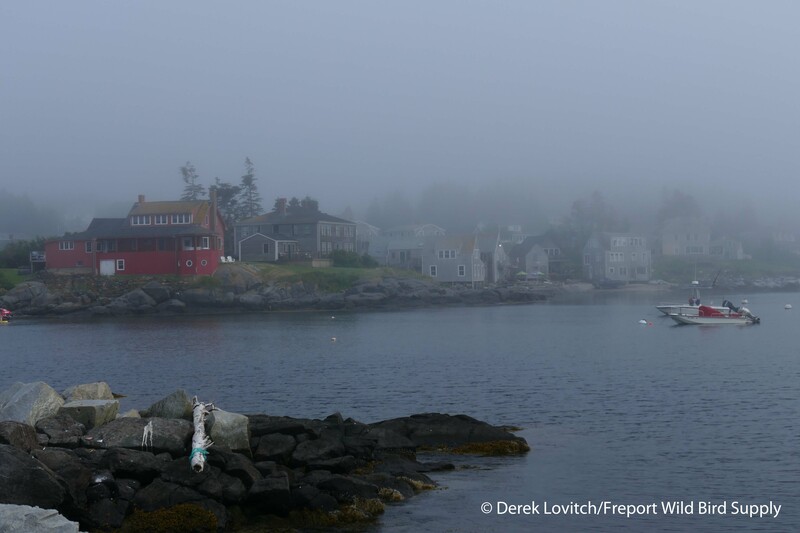 We often don’t know where we are going even as we depart Camden Harbor on our first morning! Weather (especially wind, or lack there of) dictates the plan. And I must say, it’s a nice bit of respite to not have any control over where we go! All I have to do is point out birds wherever our captain takes us. 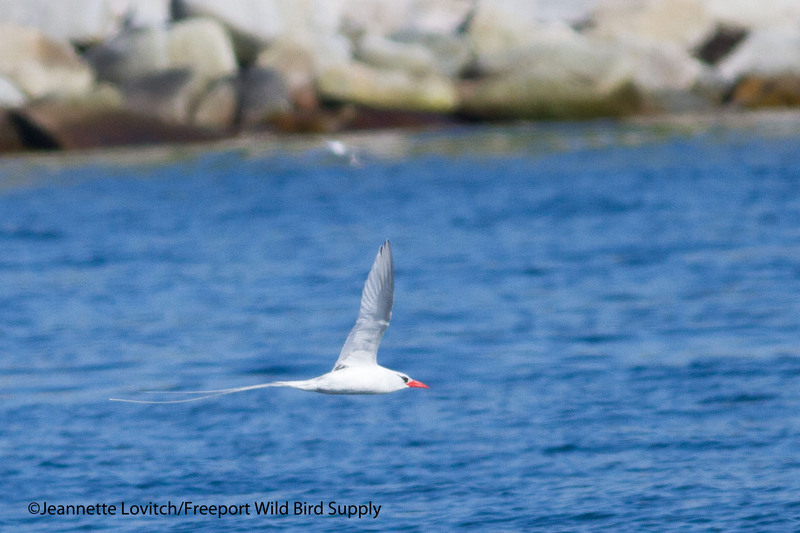 Of course, this is a birding-themed trip, so we make our best efforts to get into position for some great birding, especially to visit one or more islands with breeding seabirds. But when I boarded the vessel on Sunday night, I could only guess what a plan might be. …but soon we were back in the murk. A stroll to Marshall Point Light added to our landbird list, while a Greater Yellowlegs in the harbor was the first migrant shorebird of the trip. Overnighting in Port Clyde set us up nicely for a short trip to Eastern Egg Rock, which we rounded slowly to enjoy Roseate Terns among the Arctic and Commons, lots of Black Guillemots, and over 100 Atlantic Puffins. 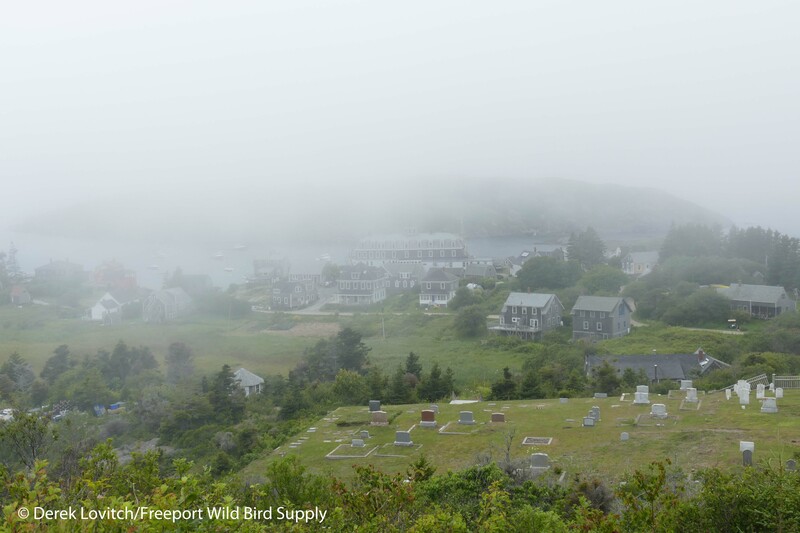 The fog lifted enough for us to have great visibility when near the island, but the offshore fog bank and cloudy skies meant a lot of puffins were on the water, and many loafed close to our boat or zipped right by. Back into the fog as we trudged offshore, seabirds were few and far between. 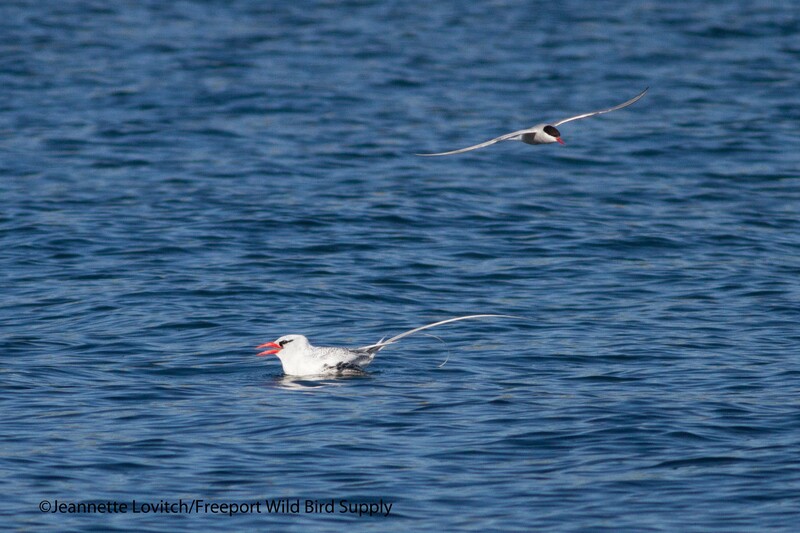 Or, I should say, we saw few seabirds…I am sure plenty were out there. 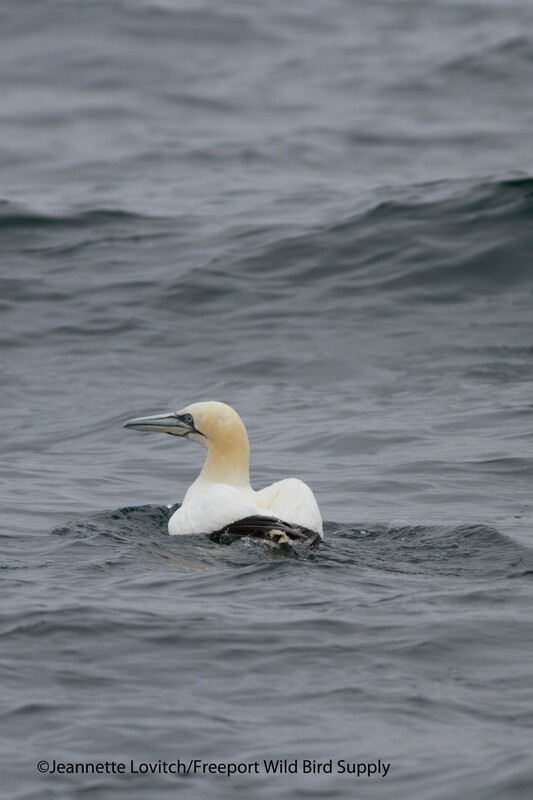 We encountered some more puffins, and this one Northern Gannet. …But few complained. Especially those of us who ended up at the Monhegan Brewing Company (Wait, how do so many of my tours end up at breweries?). 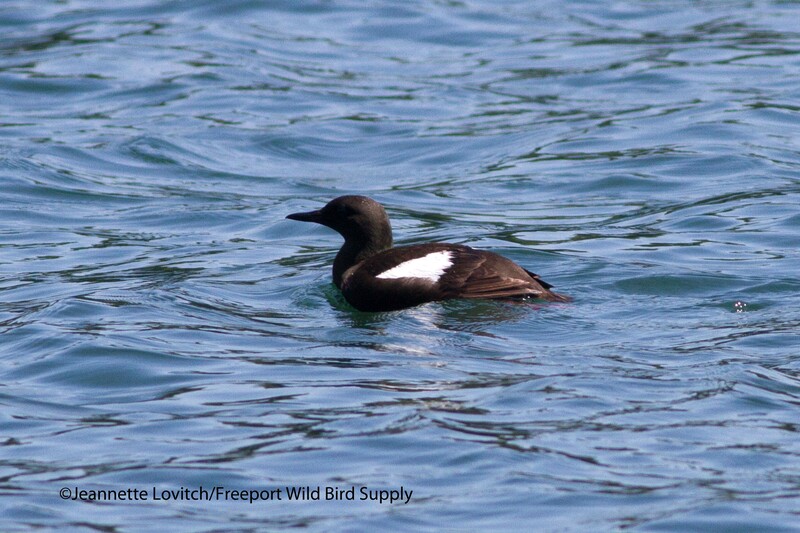 Several common breeding birds were added to our trip list, but no mid-summer vagrants were detected. 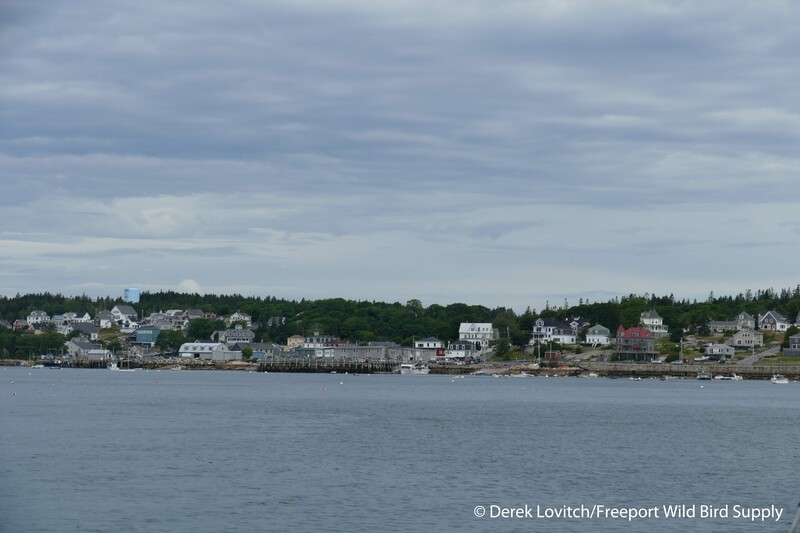 We had hoped to overnight in the harbor and take a birdwalk in the morning, but a tenuous anchorage and an approaching cold front led Captain Garth to err on the side of caution, and head for the shelter of the mainland, so we said an early farewell to Monhegan. We sought shelter up the St. George River, first in Turkey Cove, but then Garth made a last minute decision to anchor on the river’s other bank, in the Pleasant Point Gut. Overnight, the storm cleared, and so did the fog. 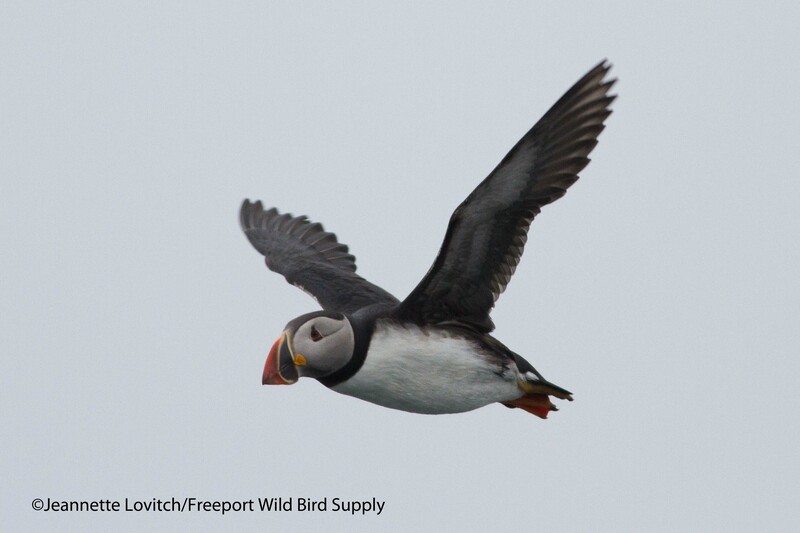 We didn’t have much wind, but what we did have facilitated a trip out to remote Seal Island. 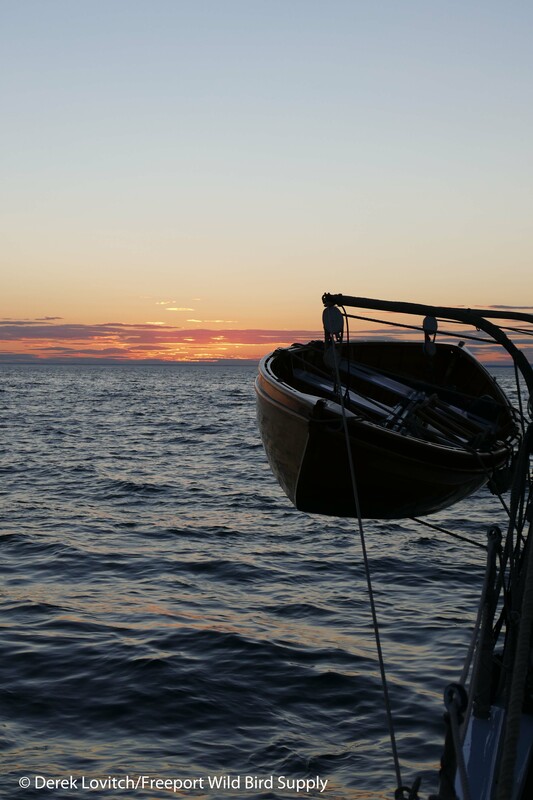 We had to motor-sail most of the way, but we had an afternoon date with a punctual local. On the way, we enjoyed some great birding. While we didn’t have enough wind to take the long way out to Matinicus Rock and deeper water, cutting a straight line around the north end of Metinic produced a whole lot of Wilson’s Storm-Petrels (450+ on the day), 6 Red Phalaropes (along with another 20 phalaropes that were just a little too far to ID), and a Mola Mola that gave us the slip. Most surprising, however, was a pair of American Oystercatchers that were flying around Little Green Island. 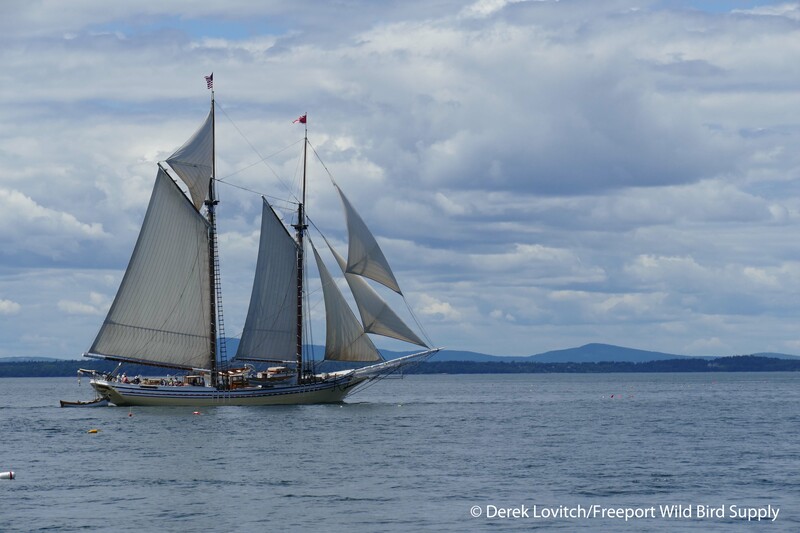 Whether this is a previously-unknown pair of this slowly-increasing species in Maine, southbound migrants, or Maine breeders undergoing post-breeding dispersal is impossible to know, but it was a new “Schooner Bird” for me: my 116th species seen during our “Birding by Schooner” tours! It was a bit of work, but we made it to Seal Island on a sunny, fairly calm day at the perfect time. 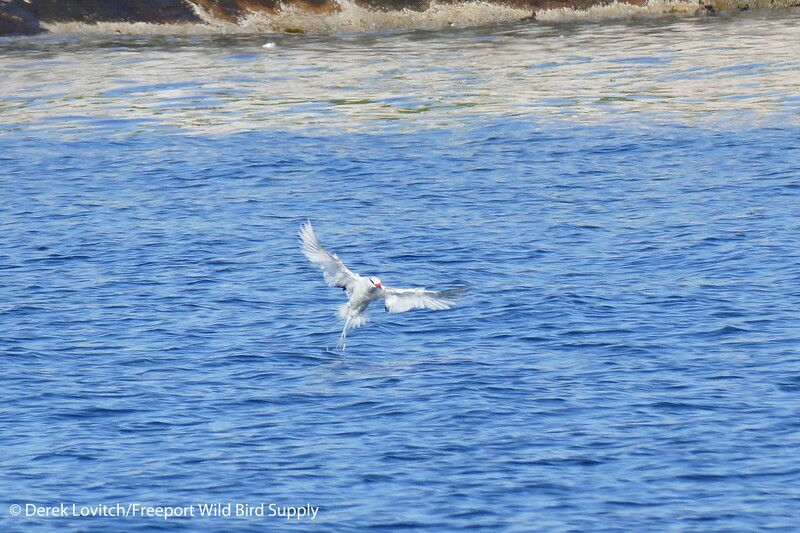 And “Troppy” the Red-billed Tropicbird that has returned to Seal Island for its 9th straight summer (10th overall in the area), made his afternoon appearance for a little bath. This was my fourth visit to Seal aboard the French, and we have seen Troppy three times (the only miss was on a cloudy day with fog the next morning). And despite that sign, we dropped anchor for a special evening. 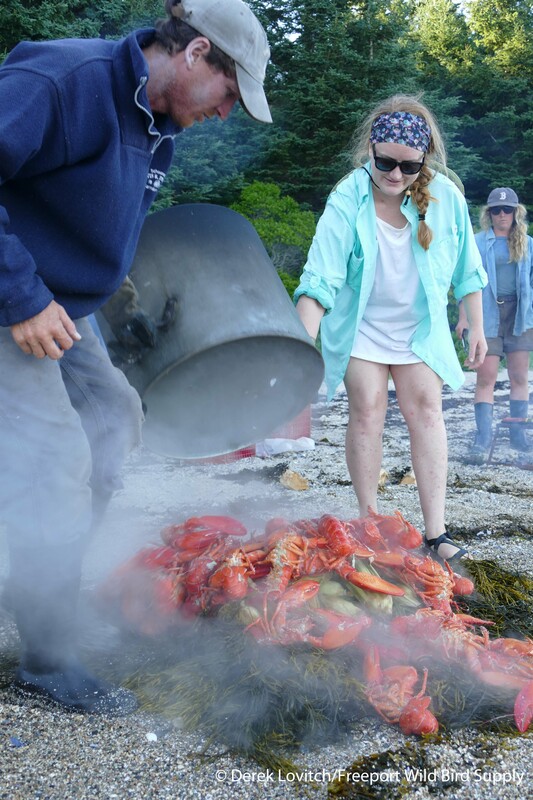 One of the unique experiences for participants on this most unique tour is an evening with the Seal Island’s biologists. 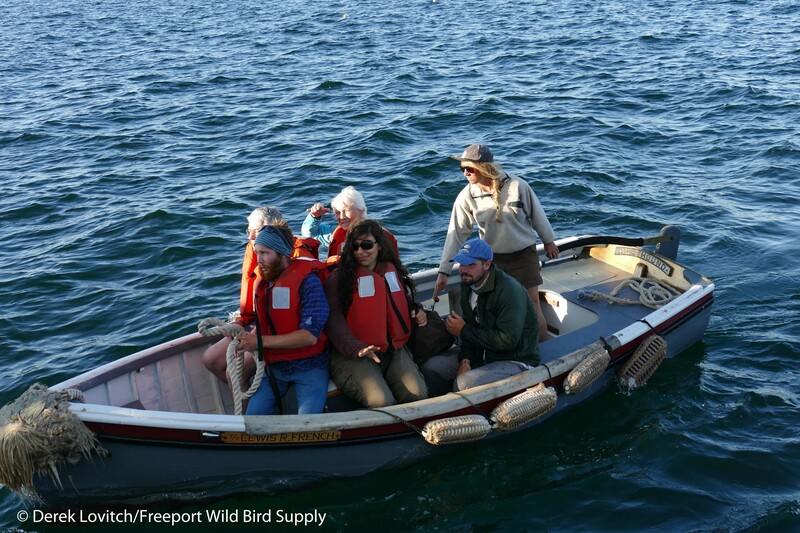 Not only do the passengers get a break from hearing me talk, the biologists get a break from cooking and their usual routine. 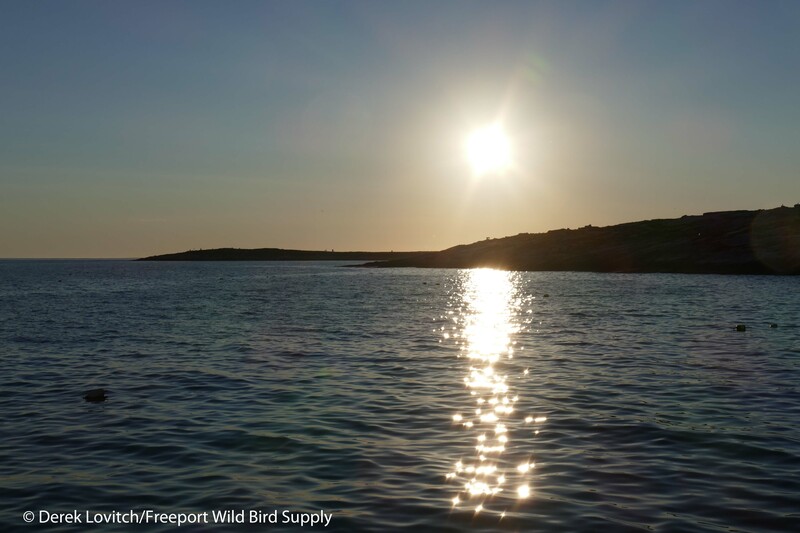 Yet another unique experience afforded by spending a night out at Seal is to get up and listen for Leach’s Storm-Petrels returning to the island from foraging trips in the middle of the night. While clear skies and a light westerly wind reduced the cacophony, the eerie, sinister chuckling of the petrels rang through the night. … more puffins, a couple of dozen Razorbills and 1 Common Murre, Great Cormorants, and more Black Guillemots than you could count. Migrant shorebirds included a Whimbrel, a flock of small shorebirds that totaled 20 Semipalmated and 2 Least Sandpipers along with 4 Semipalmated Plovers, and unexpectedly, a fly-by Wood Duck! 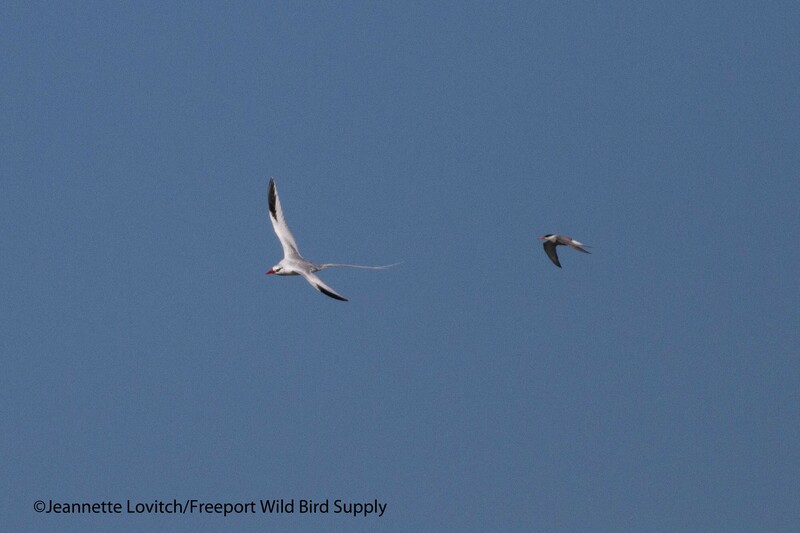 Not to mention another view of the Red-billed Tropicbird! 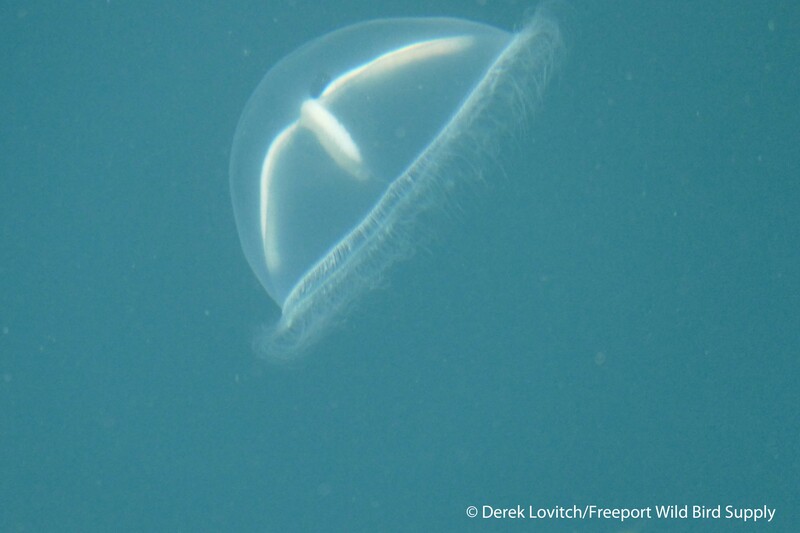 …and painful Lion’s Mane Jellies. For me, it is always too soon to depart, but we had other fish to fry, or to be exact, lobsters to boil. 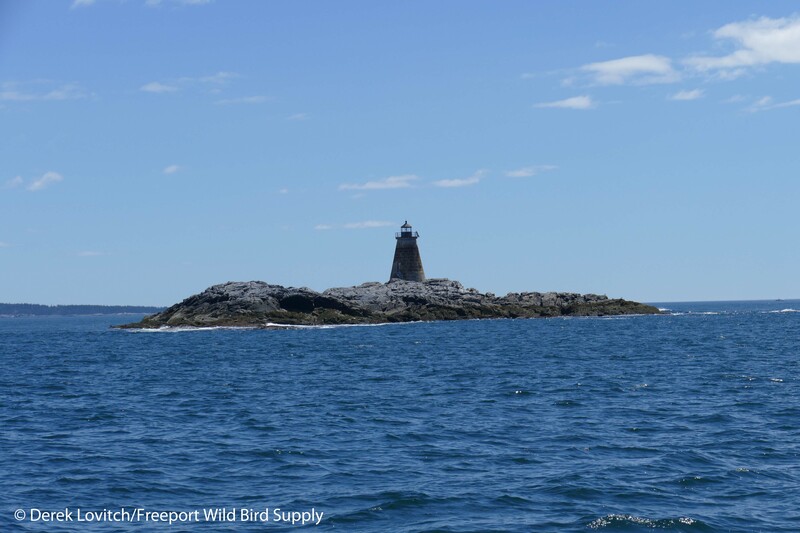 So we set a course towards Stonington, keeping our eyes open along the way. Two male Razorbills with their chick in tow were nice to see, as was a Minke Whale. 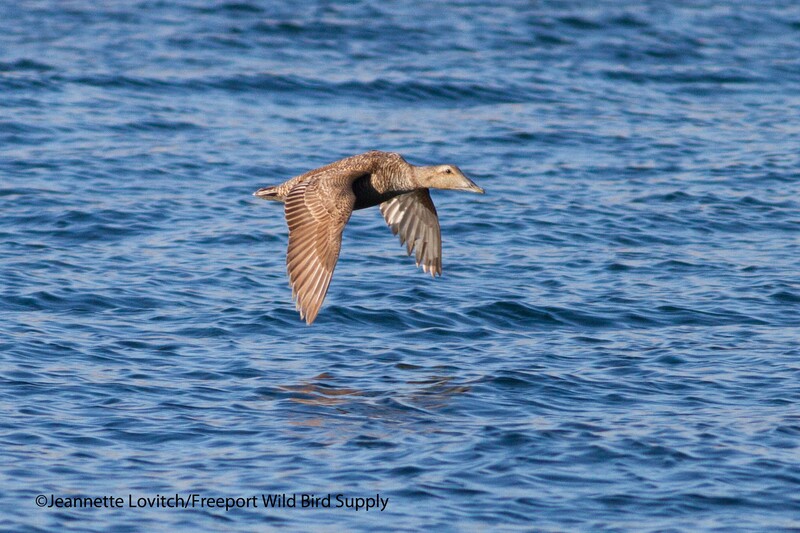 A handful of Northern Gannets and about 10 Wilson’s Storm-Petrels were our only other seabirds, however. 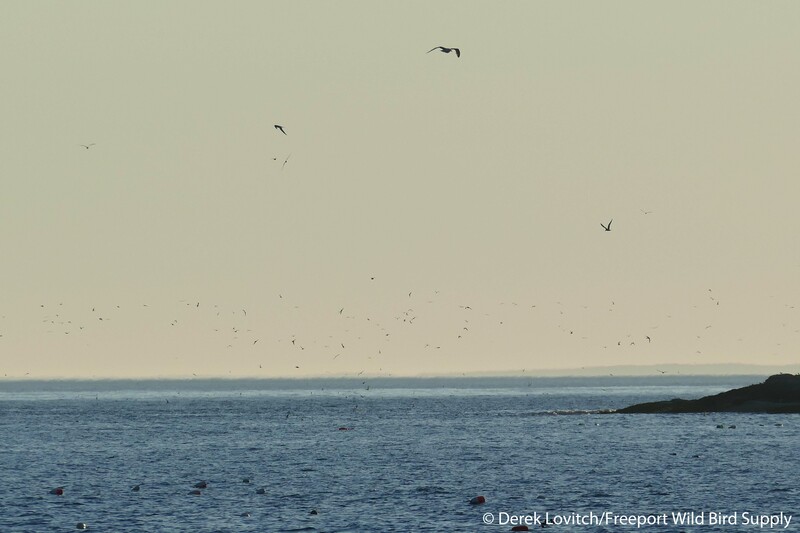 As we entered nearshore waters, we kept an eye out on islands, both big and small. 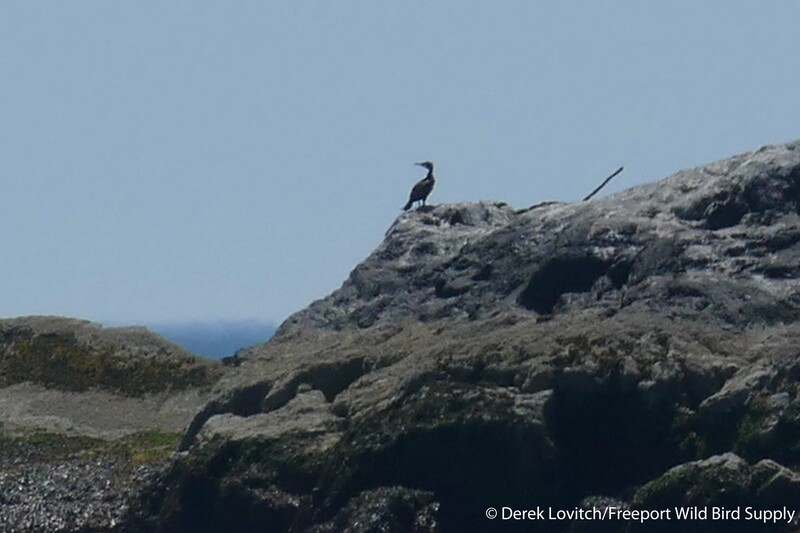 You never know what you might see, and while I am on the lookout for something “mega” like a Brown Booby, we did spot a Great Cormorant on tiny Saddleback Ledge. …and while the water boiled on Russ Island, the Angelique cruised passed us. 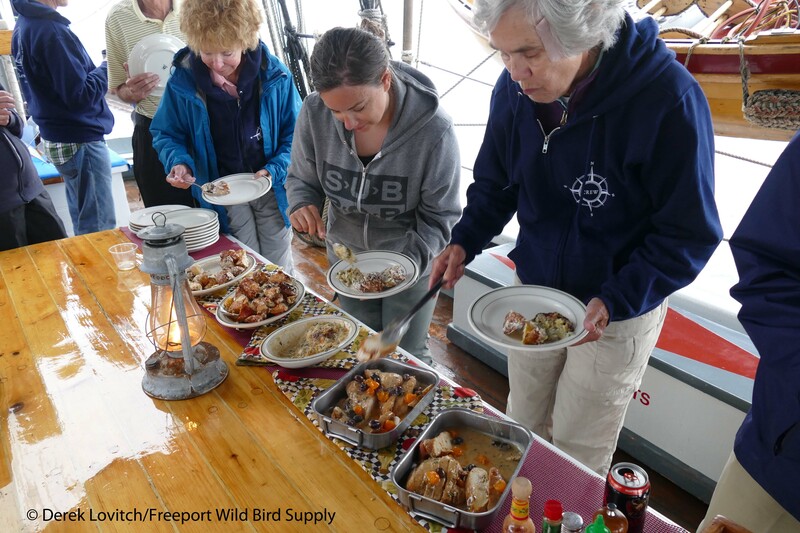 A little bird, plant, and ecology walk further swelled our appetites. Which was good, because we had a few lobsters to eat tonight. Swainson’s Thrushes offered the evening’s musical performance. A Sharp-shinned Hawk carrying breakfast over Russ Island was another addition to my Schooner List, and our morning walk around Stonington added several new species to our triplist. 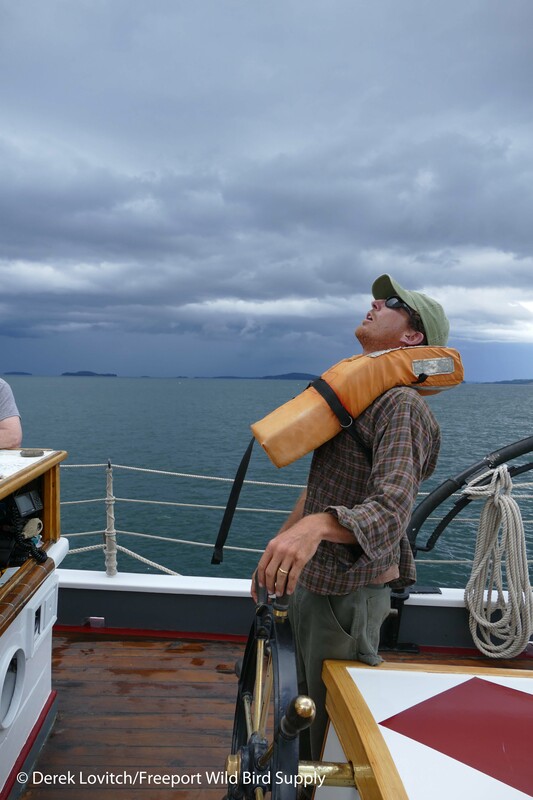 Rounding North Haven Island, we kept tallying Wilson’s Storm-Petrels (we don’t always see these birds inshore on this tour), spotted a few small groups of southbound swallows and a few shorebirds, and watched the storm clouds build. Um, should we have been worried? Nah, this crew has got it covered! 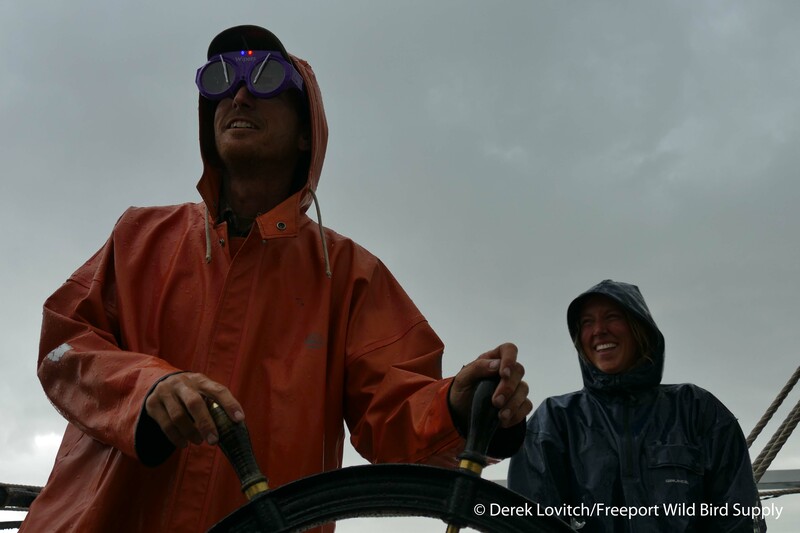 Although we had some good sailing winds ahead of the storm, and some moderate rain during the storm, the skies looked much worse than what we weathered. 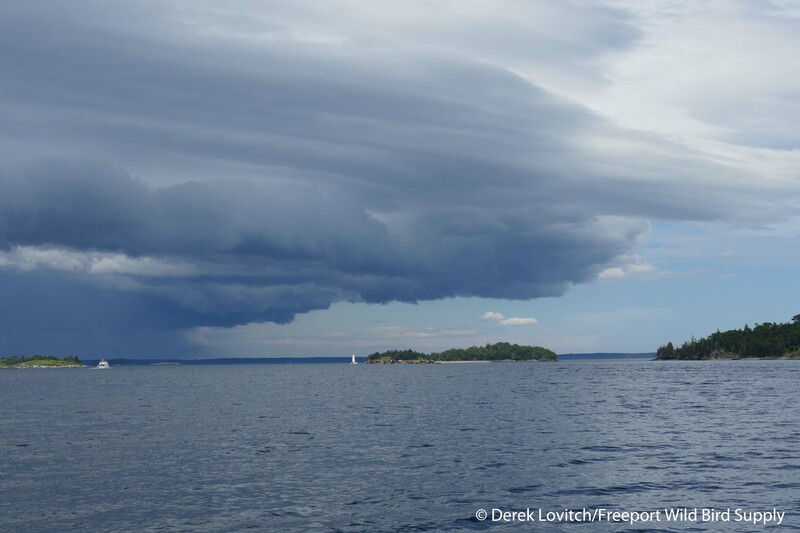 In fact, by the time we motored into Gilkey Harbor on Islesboro, the rain was ending and the skies showed a few hints of blue. And once again, we ate. Ate real well. 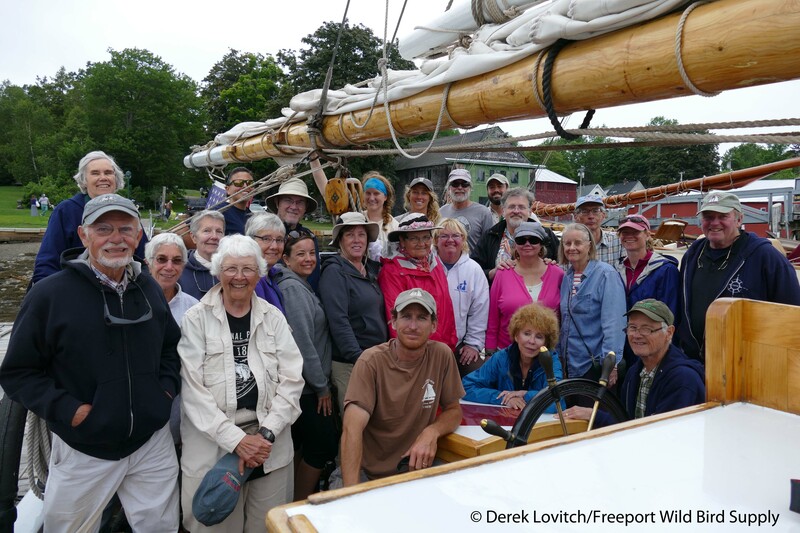 It’s amazing how fast a week aboard the Schooner French flies by – even without the birds – but it was now time to crank the anchor one last time. A Greater Yellowlegs sounded off and Ospreys circled overhead as we departed the quiet harbor for the bustle of Camden. 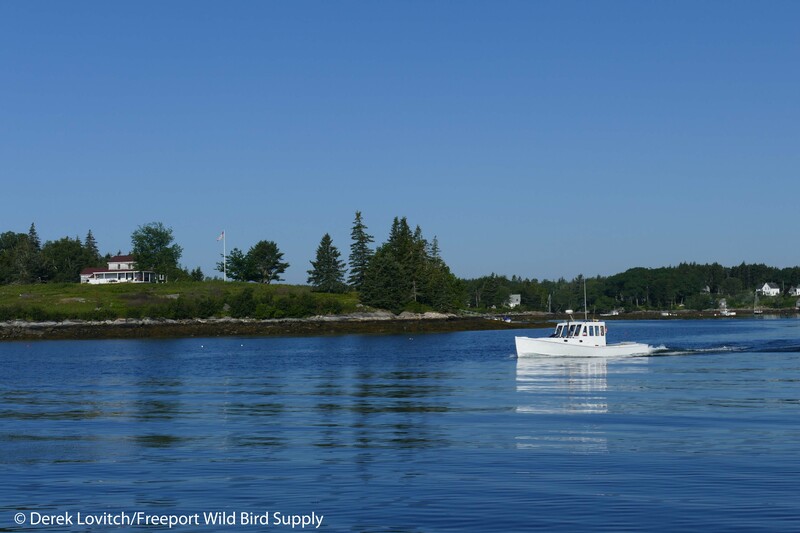 Crossing West Penobscot Bay, we encountered yet more Wilson’s Storm-Petrels, and surprisingly (for this far up the bay) another Razorbill father and kid. Chimney Swifts twittering over Camden were our 79th and final species of the tour – two over our average. 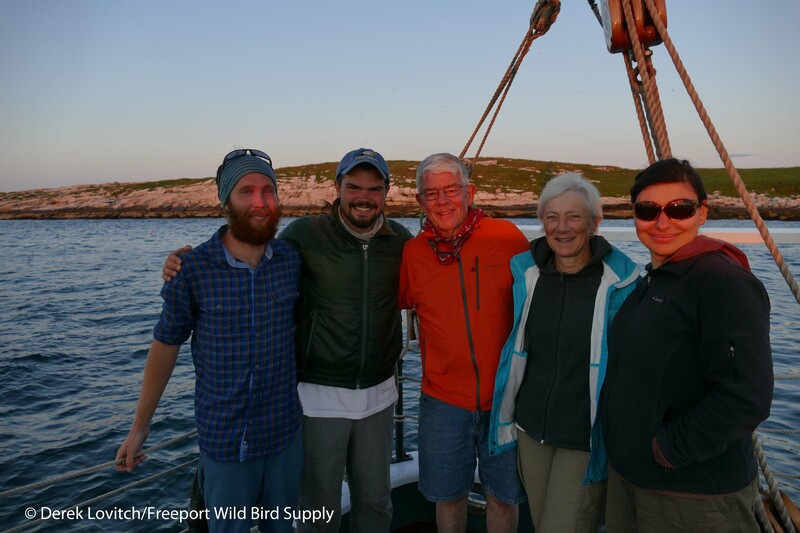 Emails were exchanged, bunks were cleared, and one last photo-op capped off yet another stellar “Birding By Schooner” tour. 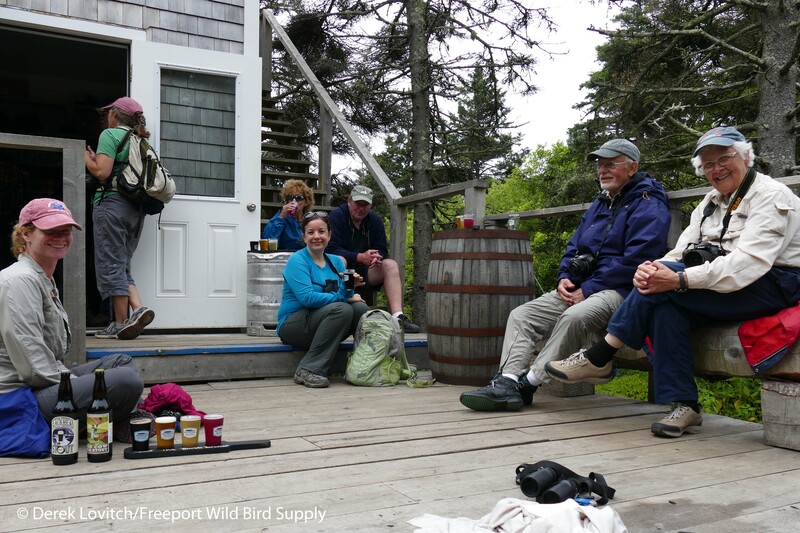 Wilson’s Storm-Petrel (daily; high day count of 450+ on 7/22, with 400+ between Little Green Island and Seal Island. 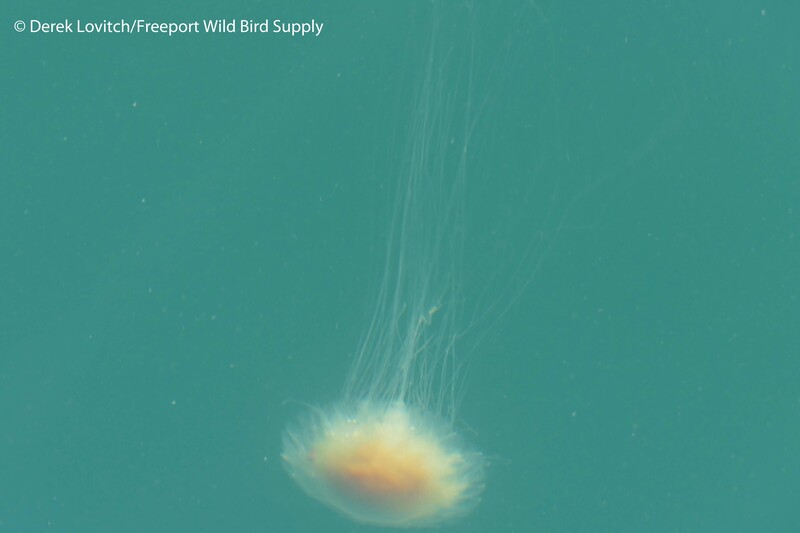 Unusually common within Penobscot Bay). 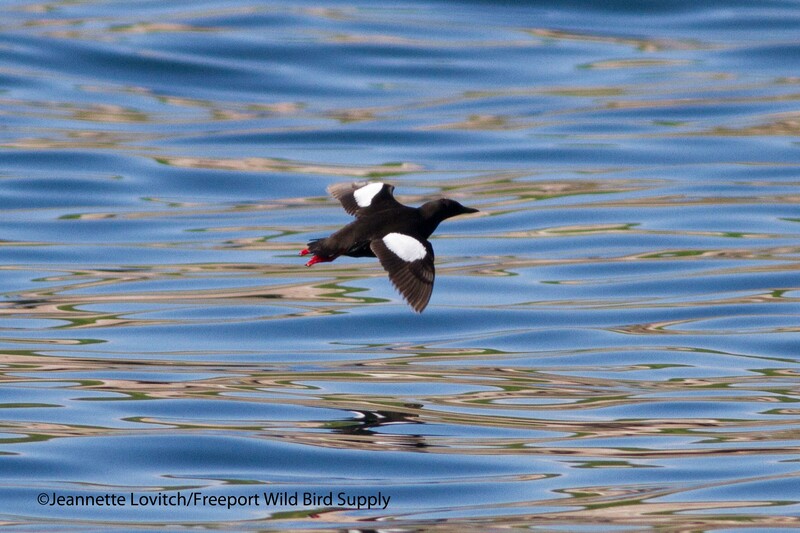 Black Guillemot (Abundant daily; several hundred on multiple days). Bald Eagle (common and seen daily; high count of 7 on 7/20). 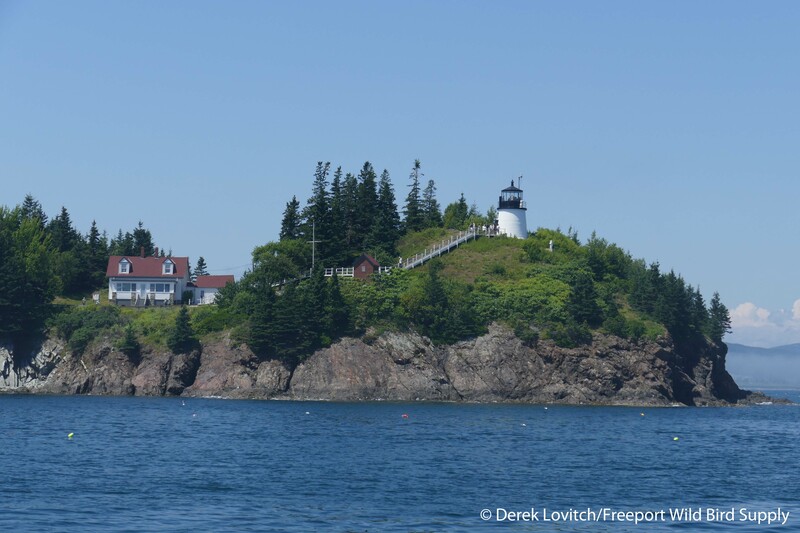 GREAT CORMORANT (35+ including juveniles at Seal Island, 7/22-23, plus 1 at Saddleback Ledge light, 7/23). 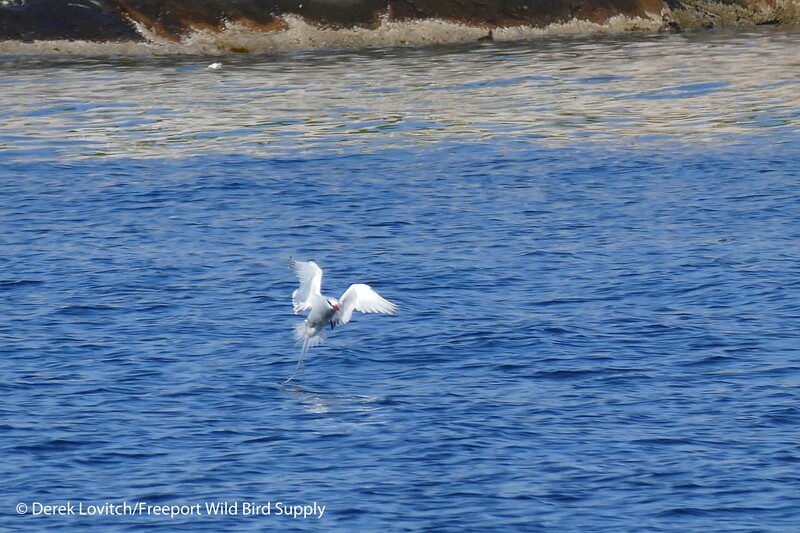 RED-BILLED TROPICBIRD (Troppy! 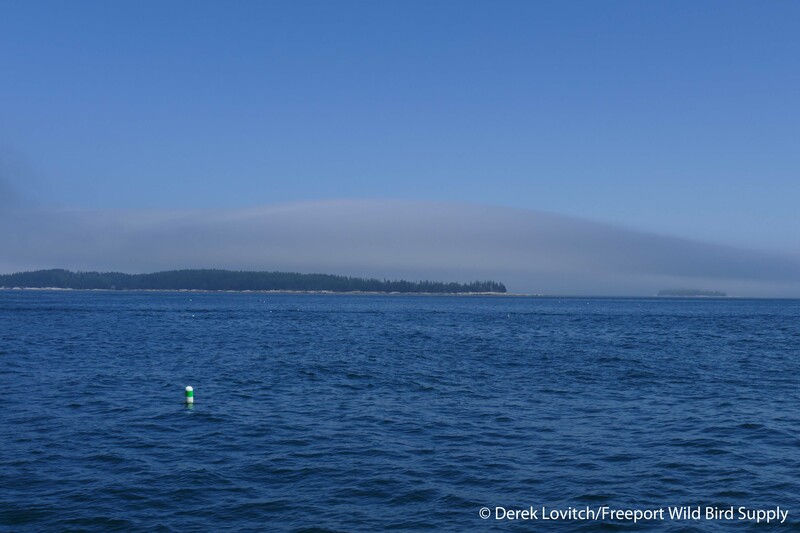 Seal Island, 7/22-23). Since every trip is unique, here are links to the trip reports from the previous two tours. And in the not-so-distant future, we’ll be posting dates and information for our 2016 adventure. This trip fills up fast, so don’t dally…sign up soon and we’ll see you aboard next year! 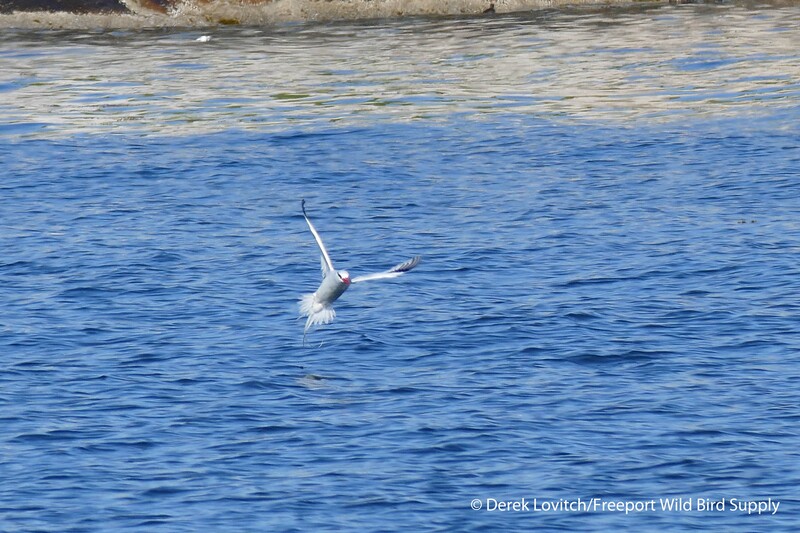 This entry was posted in Birding in Maine, Private Guiding and Tours and tagged "Birds, American Oystercatcher, Atlantic Puffin, Birding, Birding By Schooner, Black Guillemot, Freeport Wild Bird Supply, Great Cormorant, Monhegan Island, pelagics, Razorbill, Red-billed Tropicbird, Schooner Lewis R. French, seabirds, shorebirds, Tours, trips, Wilson's Storm-Petrel on July 26, 2015 by Derek.